Black Spider Optics was created by Spike's Tactical. 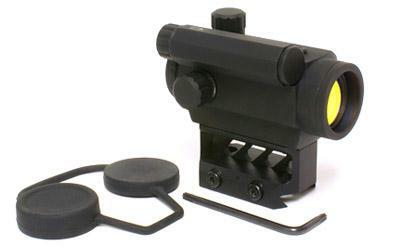 Their goal is to create quality optics at affordable prices. The Micro Red Dot Optic is a 3 MOA red dot that features an advanced ambient light filter, a raised Picatinny rail mount, auto-dimming capabilities and a battery saving auto-shut off feature. The optic is powered by a single AAA battery. The push button controls are on the side for easy access. The auto-dimming features make it easier to transition from bright enviroments to low light without manual adjustment. The aluminum tube is nitrogen-purged and allows for a lower 1/3 cowitness of iron sights. Allen key, rubber lens covers, AAA battery and a 1-year replacement warranty are included.